Their visit will include stops in Saudi Arabia, Qatar, Jordan, Egypt, and Israel. They will not be visiting with Palestinian leaders. The Palestine Liberation Organization-controlled Palestinian Authority (PA) has been boycotting U.S. officials since Trump recognized that Jerusalem is Israel’s capital last December. While Greenblatt and Kushner are not divulging details of their peace proposal, this weekend the Israeli media reported that they intend to ask Arab leaders to finance a $500 million humanitarian assistance program for Gaza, which is controlled by the Hamas terror group. Among other things, Kushner and Greenblatt reportedly are interested in building electricity and water purification installations, as well as industrial parks, in Egypt’s Sinai Peninsula, which borders Gaza. They envision these facilities serving both the Egyptians of the northern Sinai and the population of Gaza. The PA responded with fury to the news of the Kushner-Greenblatt Gaza proposal. And its anger shows why there is no reason to be upset that the PA is boycotting U.S. officials. For more than a year, aside from Hamas, the PA has been the party most responsible for the economic and environmental crisis in Gaza. Last April, the PA fired a third of its then-60,000 employees in Gaza and slashed the salaries of its remaining workers by 30 percent. The PA stopped paying Israel for electricity to Gaza. Ever since then, Gaza has received electricity only sporadically. In April, ahead of Ramadan, the PA failed to pay the salaries of its employees in Gaza. Last month, rather than pay them double salaries to make up for their lost wages, the PA slashed their salaries by an additional 20 percent. One 22-year-old father set himself on fire in a public square in Gaza in protest. Last week, hundreds of Palestinians in PA-controlled Ramallah took to the streets to demand that PA Chairman Mahmoud Abbas end his economic war against Gaza. Rather than bow to the public’s demand, Abbas declared the protests illegal. His security forces attacked protesters with truncheons and tear gas.To date, then, not only has the PA done nothing to help the people of Gaza, but the same regime that also uses every international stage to condemn Israel for the humanitarian crisis in Gaza, has taken active measures to deepen the suffering and poverty of the population. His statement also accused the U.S. of using the cause of “humanitarian aid or rehabilitation” as a means to defeat the Palestinian war against Israel by transforming the suffering of the people of Gaza into a “humanitarian issue rather than a political one.”In other words, as far as the PA is concerned, Gaza’s humanitarian crisis is not something that is supposed to be dealt with on a practical level. No one is actually supposed to improve the lot of the residents of the Hamas-controlled enclave. Rather, Gaza is nothing more than a launching pad for human cannon fodder in the war against Israel. The purpose of the Palestinians’ existence in Gaza is to suffer and die to advance the cause of Israel’s annihilation. Anyone who treats the people of Gaza as human beings is harming the Palestinian cause. If Kushner and Greenblatt are able to convince the Gulf States to finance infrastructure development in the Northern Sinai that will serve Gaza as well as Egypt, and if they convince Egyptian President Abdel Fatah a-Sisi to allow the projects to be built and to be used by both the Gazans and the Egyptians, then as far as the PA is concerned, they will be waging war against the Palestinians. In the mind of the PA’s leadership, helping the Palestinians is tantamount to defeating them in war. The people of Gaza aren’t the only ones who suffer from the PA’s never-ending war against Israel. The people who live under PA jurisdiction in Judea and Samaria also are its victims. On Monday, one of Israel’s premier think tanks, the Jerusalem Center for Public Affairs, held a remarkable symposium highlighting this abject reality. In a roundtable discussion, Palestinian businessmen and thought leaders explained how the PA’s political and economic wars against Israel, including the so-called “boycott, divestment and sanctions” (BDS) campaign, harm Palestinian society and the Palestinian economy. The discussion was held to mark the center’s publication of a collection of essaysby Palestinians and Israelis on the topic. Palestinian media analyst Khaled Abu Toameh noted that on the ground, Palestinians are more and more willing to embrace their Israeli identity and cooperate with Israeli Jews. In Jerusalem, for instance, he noted that Arab commercial centers are featuring Israeli brands and franchises of Israeli cafés for the first time. 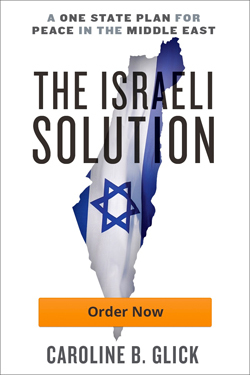 But even as the Palestinians themselves are interested in normalizing their relations with Israel, and engaging in economic cooperation with their neighbors, the Palestinian leadership is leading an international campaign to delegitimize Israel and wage economic warfare against it while making it more and more difficult for Palestinians to cooperate with Israelis. He added that the economic failure the PA’s anti-Israel efforts have induced have, in turn, reinforced its campaign against Israel. Until 2016, SodaStream’s main plant was located in the Mishor Adumim industrial zone in Judea, north of Jerusalem. After a rebranding campaign brought a rapid increase in sales, in 2010 the company began hiring Palestinian workers. Within a few years, SodaStream became the largest private employer of Palestinians. Birnbaum made multiple efforts to reach out to the PA leadership to spur additional economic growth and activity in the PA-ruled areas as a result of SodaStream’s success, but all of his efforts were ignored or rejected. In 2013, SodaStream hired actress Scarlett Johansson to appear in its Super Bowl commercial in January 2014. The announcement instigated a wave of attacks against Johansson by BDS groups that pressured her to end her relationship with SodaStream. For nine years preceding her engagement by SodaStream, Johansson had served as an international humanitarian ambassador for Oxfam, an international charity. Oxfam gives millions of dollars annually to projects demonizing Israel, including by supporting the BDS movement. Rather than defend its longtime ambassador, Oxfam published a statement condemning Johansson. She resigned from her position with Oxfam. Shortly after the controversy, the Christian Science Monitor published a feature interviewing Palestinian SodaStream employees. To the man, they defended their employer, and noted that their wages at SodaStream paid them ten times more than they received from Palestinian employers. They also expressed their fears that the BDS campaign would force the company to relocate and fire them. In the event, in 2015, SodaStream, needing a larger plant, announced it was relocating to Israel’s Negev desert. Only 80 of its 600 Palestinian workers were retained in its new facility. Nobody from the PA came to help us or even listen to our stories following our termination and unemployment in 2016…Nobody in the Palestinian leadership made an effort to replace our jobs or provide any safety net now that we were no longer receiving private insurance from SodaStream. All the Palestinian workers and their families were residents of the PA, and they should have been representing us and our interests. But this did not interest them, simply because the PA opposes Arabs and Jews working together. Professor Mohammed Dajani Daoudi, an emeritus political professor from Al Quds University in Jerusalem, has decades of experience in international development organizations and management of the Palestinian public sector under the PA. He asserted at the symposium that the majority of Palestinians want normal, cooperative relations with Israel, and do not share the PA’s view that they should dedicate their lives to destroying Israel. Dajani Daoudi personally fell victim to this denormalization effort. In 2015, he took 30 Palestinian students on a trip to Auschwitz death camp in Poland to teach them about the Holocaust. Upon their return to Jerusalem, Dajani Daoudi became a target of public vilification and death threats. His university colleagues disowned him and called for his firing. His car was torched. In short order. the university president accepted his resignation for the “crime” of normalizing Palestinian relations with Israel. It is far from clear what Kushner and Greenblatt believe they can accomplish in their efforts to forge peace between Israel and the Palestinians. What is clear enough is that the PA’s boycott will not hinder their efforts, whatever they may be. The PA’s efforts to “denormalize” Arab-Israeli relations and delegitimize Israel, even at the expense of the lives and wellbeing of the people they are supposed to represent, make clear that there is nothing to be gained by engaging with its representatives. The road to peace, to the extent it exists, does not go through the PLO or its PA.